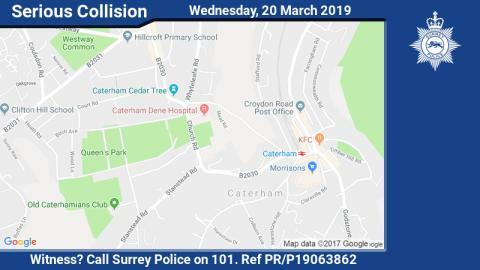 A male pedestrian has been taken to hospital with serious injuries following a collision in Caterham earlier this evening (20 March). The collision, involving the pedestrian and a Renault Modus, took place in Church Road near the junction with Manor Road around 7.50pm. The man, who is his 90s, was taken to St George’s Hospital in Tooting. His next of kin are aware. The driver was not injured as a result of the collision. The road remains closed in both directions while we deal with the incident. We are appealing to anyone who witnessed the collision, or anyone who was in the area at the time and may have dashcam footage, to come forward as soon as possible. Please call us on 101, quoting incident reference number PR/P19063862 if you can help.